Mikoyan-Gurevich Ye-8 was a supersonic jet fighter developed in the Soviet Union from and to replace MiG-21 (originally named MiG-23). Only two prototypes were built in 1960-61. 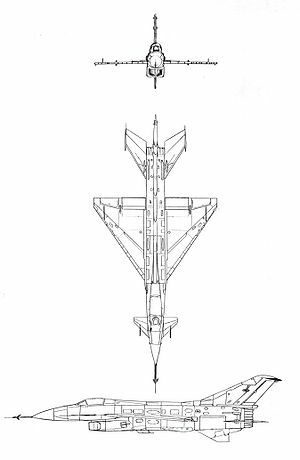 The original MiG-21's air intakes were moved under the fuselage, freeing up the nose where a larger and more powerful radar able to deliver longer range air-to-air missiles could be built in. Canards were built to both sides of the nose, in front of the cockpit (the horizontal stabilizers of MiG-21 were left at their original position). The two prototypes flew in 1962. On September 11, 1962, the Tumansky R-21F-300 engine, also under development, exploded in midair at speed of Mach 2.15. Test pilot Georgy Konstantinovich Mosolov, then one of the leading Soviet test pilot, was severely injured by debris of the compressor and had to eject at Mach 1.78. Due to unsolved technical problems the aircraft's development was abandoned; some parts were used on the MiG-23, including R-23 missiles and their associated Sapfir-23 radar. Belyakov, R.A; Marmain, J. (1994). MiG: Fifty Years of Secret Aircraft Design. Shrewsbury, UK: Airlife Publishing. ISBN 1 85310 488 4.